This is based on the third “DA” in the closing of What The Thunder Said, from T.S. Eliot’s The Waste Land, lines 416 to 425. I take this final DA to have two meanings: self control, and control of death. One inhibits, the other is impossible. The final line in the passage above – “Shall I at least set my lands in order?” – seems to be a line one would say when drawing one’s will and accepting that such a thing needs to be in place since death is inevitable. The “lands” may also refer to the waste land itself, a metaphor for our internal state of spiritual aridity, hopelessness, and despair, which are now, finally, in order. In this passage, “the arid plain” is behind and there is water and ocean imagery: calm sea, a responsive boat. The ocean represents faith in Eliot’s imagery. Thus, there appears to be love and faith restored. The speaker also seems to recognize inevitable death one day, and accepts it, though he may not surrender to it. 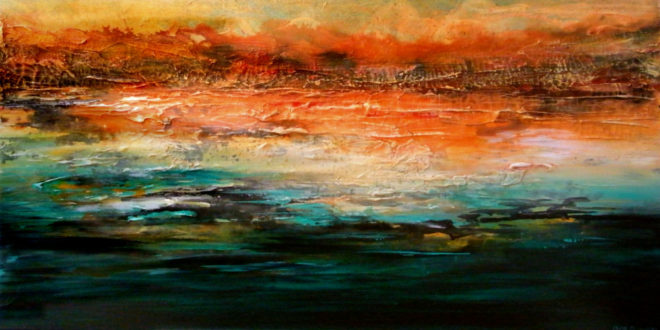 This painted version here represents the arid plain of burning, cracked shores in the distance blending into the calm sea water in the forefront.